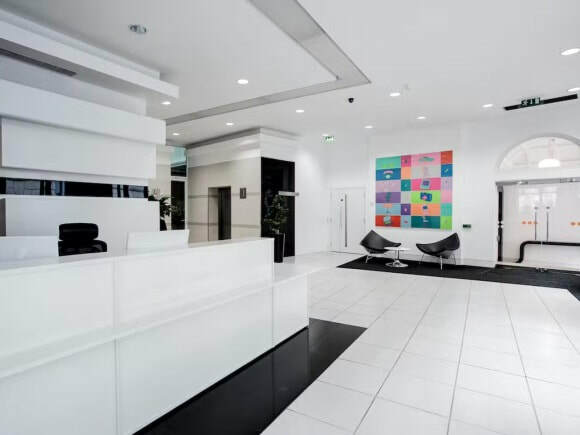 5 Chancery Lane Business Centre is a vibrant office to rent which is situated in the heart of the capital. Handy for the City Thames link rail, this modern office space has very good transport links close by with underground networks to various locations around London. There is a spacious reception on the ground floor with lifts accessing every floor of the building. Meeting room facilities can be hired onsite by a dedicated team and catering can be arranged if necessary. With business lounges available to use, there is also a stunning atrium garden in the middle of the building that is surrounded by many office suites. The individually air-conditioned serviced offices for let come with a complete set of furniture and are pre-wired with internet and phone points ready for connectivity. Various sizes are available to rent and contracts can be negotiated for long or short-term periods. Other features for this office rental include an onsite cafe/restaurant and 24 hours access.